This mascara is the perfect finish for creating your very own "Cleo Eye Design"™. Although it's wear is enduring, Tarte Mascara is removable with what ever you use to wash your face. However, for the most gentle, quickest and cleanest removal - plus optimum wear of all of your eye make-up tomorrow - use our "Clean Eyes Eye Make-up Remover" tonight. Most mascaras hinder eye lash health but, instead of causing wear and tear, the use of Tarte Mascara will provide continued enhancement of the benefits. 7 mL / 0.24 Fl. Oz. olive esters, stearic acid, cera carnauba, triethanolamine, alcohol, candelilla cera, acacia senegal gum, panthenol, VP/VA copolymer, polyvinyl alcohol, aminomethylpropanediol, chlorphenesin, iron oxides (CI 77499). Lights, camera, lashes! 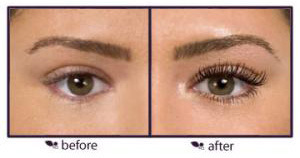 mascara is clinically proven to increase lash volume by 424%. The patented dual-brush technology separates and evenly coats lashes while the unique 4-in-1 formula gives you bombshell lashes worthy of a freeze frame.